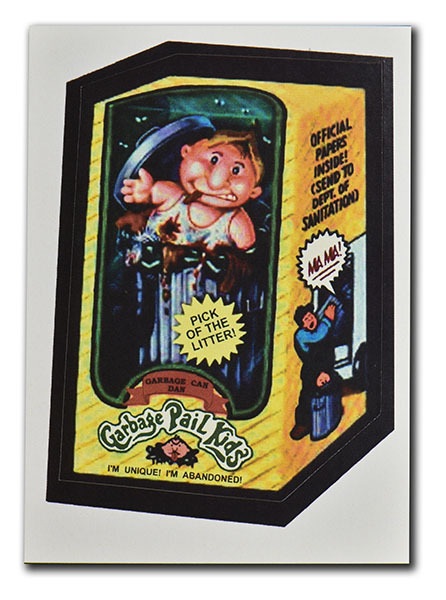 The original Garbage Pail Kid was itself a Wacky Package that was painted by John Pound but never used. At the time Cabbage Patch Kids were not all that popular, but a while later they became huge and Topps decided to make an entire parody series about them based on the GPK original. This eventually led to a nasty law suit between Topps and CPK. At some point the CEO of Topps was so aggravated by the whole thing that he demanded the very first original GPK be brough to him so he could burn it - and that's exactly what he did. All that remained was a modest photograph. This was included in the LW1 series and was eventually remastered to high resolution and printed again in LW3. In any case, the only place the very first ever GPK was printed was in these lost wacky series, which alone makes them highly sought after.